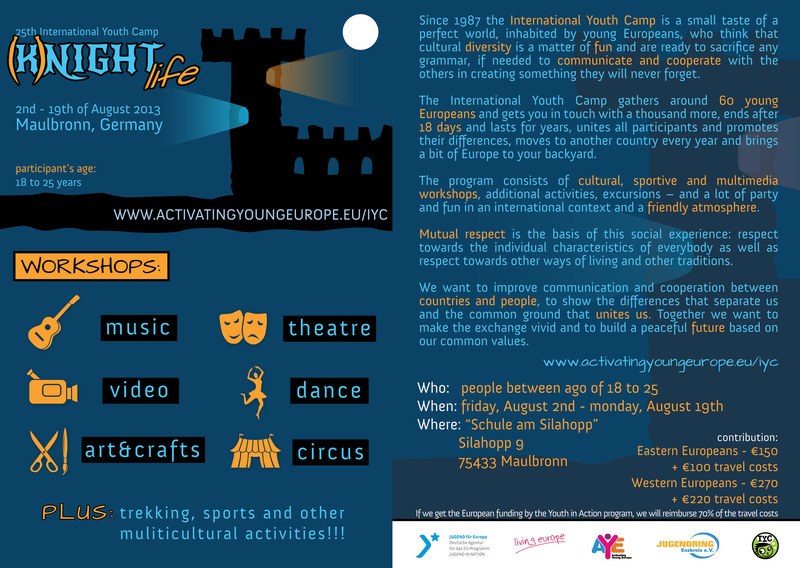 This year the International Youth Camp is taking place from the 2nd to the 19th of August in Germany, in the city ofMaulbronn. For most workshops you don’t need to bring any other equipment than your body and mind because we’ll provide everything that’s needed. Musicians should bring their own instruments if possible, though. Pianos, keyboards, drums and other big instruments can be provided if announced in advance. Why don’t you just print the application form*, fill it in and send it to the nearest organiser? *In order to secure your participation an advance of €100 of the contribution must be satisfied. In case of no-show that quantity will be reimbursed ONLY if you find a replacement or in case of force majeure. If we get the European funding of the Youth in Action program, we will reimburse 70% of the travel costs.